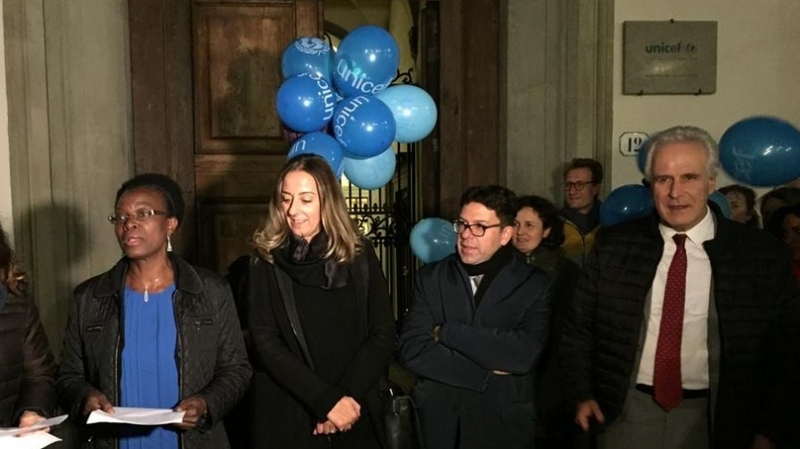 (20 November 2018) The City of Florence joined the UNICEF Office of Research-Innocenti and the Istituto degli Innocenti in lighting the Loggia dei Lanzi and the historic Innocenti facade in blue, the colour that has come to signify children worldwide. By illuminating their monuments in blue, they committed to uphold the rights of childhood and remind the public of their common history of protection, care, support and research for children all over the world on the anniversary of the adoption of the United Nations Convention on the Rights of the Child (CRC). The short lighting ceremony was opened by Sara Funaro, Councillor Welfare and Health, Municipality of Florence; Priscilla Idele, Director of the UNICEF Office of Research Innocenti; and Giovanni Palumbo, Director General of the Istituto degli Innocenti. “We are happy and proud to participate in the World Children’s Day by illuminating the Loggia dei Lanzi and the facade of the Istituto degli Innocenti. The Istituto is world-renowned a jewel of architecture and art but above all a symbol of what Florence always was and is: a city with a big heart, at the service of those most in need," said Dario Nardella, Mayor of Florence. "It was here, according to a centuries-old tradition, abandoned babies and children found the care, warmth and hospitality they did not always receive in their own homes. Even to this day the Instituto carries out important work for children and the UNICEF initiative could not find a more appropriate and worthy site than this." World Children’s Day is commemorated each year on 20 November, the date the CRC was adopted in 1989. The CRC is the most ratified UN convention and has been signed by 196 countries. Italy was not only one of the early signatories of the convention, but also committed resources to help implement the CRC by the ongoing support for UNICEF’s Office of Research in Florence. “Today Florence joins more than 100 countries where key landmarks will #GoBlue for World Children’s Day to symbolically call for greater attention to children’s rights and a brighter future for all children. We are especially proud to be part of the huge global initiative from the city where humanism, philanthropy and the care of children began more than 600 years ago and flourishes to this day,” said UNICEF Innocenti Director, a.i., Priscilla Idele. Next year, UNICEF Innocenti will simultaneously celebrate the 30th anniversary of the adoption of the CRC, as well as the 30th anniversary of UNICEF’s Office of Research-Innocenti hosted in Florence, Italy, which will also coincide with the 600th anniversary of the Istituto degli Innocenti, established in 1419. “We are honored to be part of the #GoBlue worldwide initiative launched by UNICEF and to ‘paint’ the façade of the Istituto degli Innocenti to commemorate the anniversary of the UN General Assembly's approval of the Convention on the Rights of the Child and Adolescence. The principles of this convention have guided the work and activities of our Institute here over the past 600 years caring for the rights of children and young people,” said Maria Grazia Giuffrida, President of the Istituto degli Innocenti. “Each 20th November 20 is a special day for the Istituto degli Innocenti, a day when we celebrate the commitment to a better future for all children starting with inclusive education, the right to play, to live in peaceful, to food, to feel safe. The Istituto degli Innocenti will be always close to where there are children in need. We support this beautiful initiative of UNICEF today as part of our 30-year long collaboration with the UNICEF Office of Research-Innocenti, hosted by the Institute." The UNICEF Office of Research – Innocenti is the dedicated research centre for UNICEF. Thanks to the continuing support from the Government of Italy, it exercises a leadership role on research, with a mandate to develop a research agenda that focuses on knowledge gaps relevant to the strategic goals of UNICEF and its key partners. Washed in blue light, the Loggiato of Innocenti and the City of Florence will remind the thousands of visitors and residents that pass through its ancient cobble stones each day, of its rich heritage of philanthropy and of its shared commitment to tackling today’s most pressing challenges for children through rigorous research, advancing knowledge and proposing best policies and practices that work for every child, everywhere. On this World Children’s Day UNICEF Office of Research, the Istituto degli Innocenti and the City of Florence join UNICEF offices around the world in raising awareness for the millions of children who are unschooled, unprotected and uprooted. UNICEF invites the public to go online and sign its global petition asking for leaders to commit to fulfilling the rights of every child now and for future generations, and to Go Blue for every child by doing or wearing something blue on 20 November. (21 November 2017) A national celebration of World Children's Day (20 November) for Italy was held at Istituto degli Innocenti under the title Bambini, d(i)ritti verso il futuro, which means roughly "Children Stand Up for Their Rights." The event was attended by Italy's national Minister for Constitutional Reforms and Equal Opportunity, Maria Elena Boschi, together with Tuscan Regiona and Florence officials, senior management of the Istituto degli Innocenti, Sarah Cook, Director of UNICEF Innocenti and school children from several Florence schools.